Green beans are a versatile vegetable that's widely available fresh, frozen or canned. They're typically green, but there's also a yellow variety, as well as, less commonly, a purple one. You'll sometimes hear green beans called string beans or wax beans, depending on what part of the country you happen to be in. The French version of green beans, called haricots verts (pronounced "ha-ree-ko vair"), are a bit more slender than the ones we're used to seeing here in the States. How Should I Select Fresh Green Beans? When purchased fresh, green beans should be firm and should snap when bent in half. You'll want to trim off the tough ends before cooking them, and you can also peel away the fibrous strip along the edge if you're particular. You can cut the pods to shorter lengths, as well. Should I Use Canned Green Beans? Long answer: Unfortunately (with the possible exception of corn), canned vegetables are almost universally dreadful. Nowhere is this truer than canned green beans. While it's important to temper one's expectations when it comes to canned anything, it's difficult to imagine anything more disheartening than opening a can of green beans and beholding the limp, overcooked, colorless and utterly flaccid little pods within, soaking in their disappointment. What About Frozen Green Beans? Frozen green beans are not as good as fresh, but they're miles better than canned ones and thus a decent compromise. The nice thing about frozen green beans is that they're quick frozen but not cooked, which means they retain their color—although their texture suffers a bit in the process of freezing and thawing. What Color Should Green Beans Be? How you cook green beans can affect their color. As a rule, you want your green beans to have a bright, vivid, green color. You'll notice when you blanch green beans that their green color will intensify after a couple of minutes. If you keep cooking, that green color will fade and turn a drab shade of olive green. In addition to overcooking, cooking them in a liquid with a high acid content can also cause green beans to lose their color. That doesn't mean you shouldn't use acid when cooking green beans—lemon juice and green beans are a classic combination. Optimally, we'd sauté the green beans and add a splash of lemon juice at the end. One instance where the acid would cause a problem is if the green beans were simmered in an acidic tomato sauce. Conversely, an alkali like baking soda can give green beans a brighter color, but don't try this trick either: it'll make the green beans mushy. What's the Best Way of Cooking Green Beans? Like other green vegetables, green beans should be cooked quickly, with high heat, preferably in small batches. Steaming or sautéing are ideal cooking methods for preparing green beans. 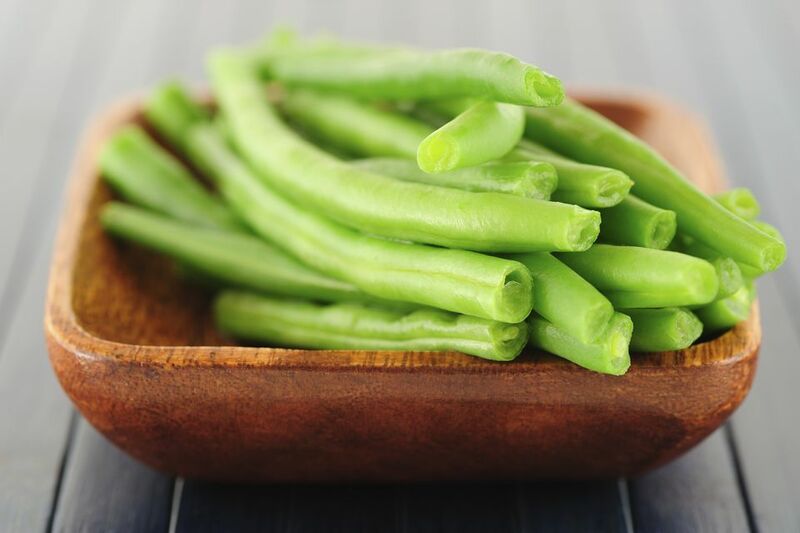 When properly cooked, green beans should still have a crisp texture, and a vibrant, bright green color. As discussed above, overcooked green beans can be identified by their drab, olive-green color and their mushy texture. Overcooking can also cause nutrient loss. What Flavors Pair Well With Green Beans? Green beans combine nicely with lemon juice, butter, dill, basil, garlic, onions, mushrooms, as well as soy sauce, almonds, and of course, bacon. Do You Know Your Mango Varieties?